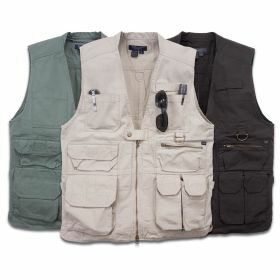 Offering unprecedented functionality and versatility, the 5.11 Tactical® Vest has been a favorite of law enforcement officers, sportsmen, and outdoor enthusiasts for a generation. Built from rugged, dependable, and surprisingly comfortable 8.5 oz. 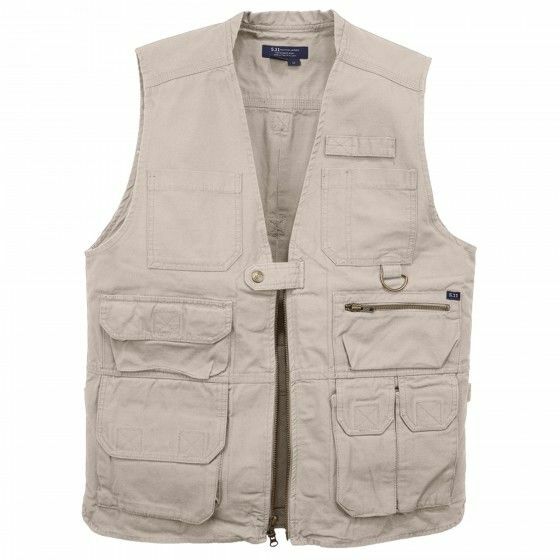 cotton canvas, the 5.11 Tactical® Vest features 18 individual pockets and TacTec System™ compatibility, allowing you to keep everything you need within easy reach. Twin concealed carry compartments at the chest offer quick access to a sidearm or accessories, dual water bottle pockets at the small of the back keep you hydrated, and a massive 360 degree pocket that wraps around the waist can store just about anything. Additional storage pockets are sized for essential accessories – including AR magazines, sunglasses, and a tablet – while extensive bartacking and quad-stitched reinforcements ensure lasting durability in tough environments.